The Department of Defense (DOD) rescinded the restrictions on direct ground combat for women in January as part of an effort to promote equality in the armed forces and increase opportunities for female soldiers. Military branches are currently researching the performance of females who volunteered for infantry officer and enlisted training courses, and the service chiefs have repeatedly said that standards will not be lowered to accommodate women in combat roles. "The Pentagon and the White House see this as being about equal opportunity—it’s not about that," said retired Army Lt. Col. Robert Maginnis, author of the book Deadly Consequences: How Cowards Are Pushing Women into Combat, in an interview. "What kind of nation pushes its young women into direct ground combat? A nation that is willing to compromise security even more and a nation that will not survive in the long term." Chairman of the Joint Chiefs of Staff Gen. Martin Dempsey has said all military occupational standards will be reviewed as women are integrated into combat roles by the end of 2015. The services also say exemptions could still remain for certain positions and units. "If we do decide that a particular standard is so high that a woman couldn't make it, the burden is now on the service to come back and explain to the secretary, why is it that high?" Dempsey said in January. "Does it really have to be that high?" Critics say that leaves the door open to artificially lowered standards. While current law stipulates that military occupations should be "without differential standards or evaluation on the basis of gender," a February memo by the Congressional Research Service (CRS) said the services have liberally interpreted that provision in the past. "The use of the term ‘gender-neutral physical standards’ raises questions depending on how it is defined," the memo said. "A plain reading of the term suggests that men and women would be required to meet the same physical standards in order to be similarly assigned." "However, in the past, the services have used this and similar terms to suggest that men and women must exert the same amount of energy in a particular task, regardless of the work that is actually accomplished by either." A report released last month by the Center for Military Readiness (CMR) notes that the Marine Corps’ implementation plan for women in combat includes similar criteria. Scores for men and women on the Physical Fitness Test (PFT) and Combat Fitness Test (CFT) were "gender-normed" in 2009 in order to "account for physiological differences between genders," according to footnotes in the plan. For example, women receive higher scores on the CFT "Maneuver Under Fire" event—previously pass-fail—for completing it in the same time as men. A male trainee would earn the minimum of 60 points for completing it in 3 minutes and 58 seconds, while a female would earn 88 points for completing it in the same time. As a result, a male would fail the CFT by accruing 189 points or less on three "gender-normed" exercises, while a woman with the same performances would earn a total of 247 points and qualify for the second-highest rating class. "It is a way—whether deliberate or not—it is a way to give credit to women at a different rate than men," said Elaine Donnelly, CMR president and former member of the Presidential Commission on the Assignment of Women in the Armed Forces, in an interview. "The problem is there is no ‘gender-norming’ on the battlefield. There is no ‘gender-norming’ when someone is in a burning vehicle." "It elevates the risk that you will have more casualties," she said. Three female Marines passed the infantry training course at Camp Geiger, N.C., for the first time last month, while a fourth was unable to complete her final tests after suffering a stress fracture in her leg. Ten women have tried and failed to pass the more rigorous Infantry Officer Course (IOC) at Quantico, Va.
Capt. 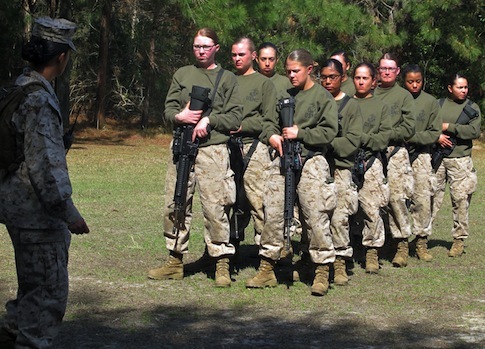 Maureen Krebs, Marines spokeswoman, said the women who volunteered for the Camp Geiger course did not receive "gender-normed" scores on the PFT and CFT and had to meet the same standards as men. The three women who successfully passed the course will not be immediately allowed to join an infantry unit while the Marine Corps conducts more tests. "Standards will not be lowered," Krebs said in an email. "We've reviewed all 335 of our primary [Military Occupational Specialties (MOSs)] and validated the physically demanding tasks for them. They are task based or performance based standards that all Marines in that MOS must be able to perform; for example, a tank Marine must be able to load a tank round." "Currently there are 47 female Marines, company grade officers, and staff non-commissioned officers, who were assigned to 19 battalions which were previously closed," she said. "This assignment experiment began in June 2012." Still, Donnelly expressed concerns that the success of women at Camp Geiger might prompt Marine Corps leaders to reevaluate the more demanding IOC. "These gender political pressures being what they are, the pressure is already on the IOC to make it possible for someone to at least pass that course," she said. Rep. Duncan Hunter (R., Calif.) has attempted to prevent that from happening. Hunter, a former Marine who served in Iraq and Afghanistan, began advocating in February for a provision in the 2014 National Defense Authorization Act (NDAA) that would codify equal standards for women and men in combat training. The current version of the NDAA, which the House passed on Thursday and is expected to be taken up in the Senate early next week, contains language mandating that "all members of the Armed Forces serving in or assigned to the military career designator must meet the same physical and performance outcome-based standards." Joe Kasper, communications director for Hunter, said in an interview that the congressman felt the vague "gender-neutral" language in the law needed to be updated. "He’s not thrilled about lifting the [combat] exemption, but he recognizes it’s where we are, and because of that we have to maintain the high state of readiness," Kasper said. Kasper said Hunter believed that special operations forces in particular were not prepared to lower their elite standards in order to admit women. Additionally, it remains unclear how many women are actually interested in entering combat. Just 13 percent of female respondents to a recent online survey conducted by the Military Times said they would take a combat job, while 77 percent said no. A group of female Marines also told Secretary of Defense Chuck Hagel in July that incorporating women into combat roles could lead to lower standards and increase sexual assault rates. "I haven’t met a female Marine or a female in general who is standing up and shouting, ‘I want to be infantry,’" one captain said. However, they may not have a choice. When Rep. Loretta Sanchez (D., Calif.) asked Marine Lt. Gen. Robert Milstead at a committee hearing in July about whether combat assignments could be voluntary for women, he said no. "That's why they're called orders," he said. Maginnis, the retired Army lieutenant colonel, noted that the United Kingdom decided not to assign women to the infantry in 2002 and 2012 because of a steep increase in injuries during a "gender-free" training experiment. "They came to the conclusion that this didn’t make sense; there’s no reason that women should have to suffer," he said. "There was no political and military reason to move forward with women in direct ground combat." A recent DOD study also found that sexual assault rates were twice as high among women who deployed and experienced combat. Maginnis said interviews he conducted with service members for his book confirmed high rates of sexual abuse in Iraq and Afghanistan. Maginnis added that female soldiers typically get promoted at equal or faster rates than men and are proficient in many positions. He is concerned about the small percentage in actual combat scenarios, he said. "I’m only talking about the ‘tip of the spear,’ the people that are actually doing the killing," he said. "If you are going to compromise those who are actually doing the jobs for political correctness, you could care less about the security of this country." This entry was posted in National Security and tagged Chuck Hagel, Military. Bookmark the permalink.